I’ve just received the evaluations from a ‘strategy day’ I facilitated for the staff and management committee of Labour Behind the Label back in mid February. LBL is a small but impressive campaign for the rights of workers in the garment industry around the world. They’re the UK platform of the international Clean Clothes Campaign. They have a relatively tiny team of dedicated staff and volunteers having far more of an impact than you might think, given their size. One of the reasons for that might be their commitment to thinking through their strategy every year. But they’re also faced with the dilemma of limited resources. Bringing together their management committee (who are scattered across the UK) and their staff with an external facilitator costs time and money that they struggle to find. No wonder that so many organisations try to do strategy in just one day. For the facilitator it’s also a real challenge. Take one passionate and diverse group of people. Start late morning to allow for everyone to arrive. Finish reasonably early in the afternoon to allow for people to get their trains home. Allow plenty of time at lunch for people to catch up, network and just relax in each other’s company, and still try to get to concrete strategic decisions in a day. Oh, and agree those decisions by formal consensus. Half the time I think we should just say “no, sorry, can’t be done”. But I also realise that for many organisations even one day can feel like a luxury. So you do what you can. In this instance we got about as far as I had hoped we could. We used a mix of tools and techniques, with groups working in parallel on the different discussions LBL had identified as most important to it this year. To ensure a coherent, efficient and yet creative thinking process we used Edward de Bono’s six thinking hats, and then threw in a bit of ‘critical path analysis’ for good measure. I’m told critical path analysis means something else in the garment industry, so we reverted to the much nicer shorthand of ‘stepping stones’. As you can see from the photo, one small group even accepted my offer of working on the floor with paper plates, thus engaging their bodies as well as their minds. The participants worked hard and some important discussion were had and were heard. Clear directions and action points did emerge. 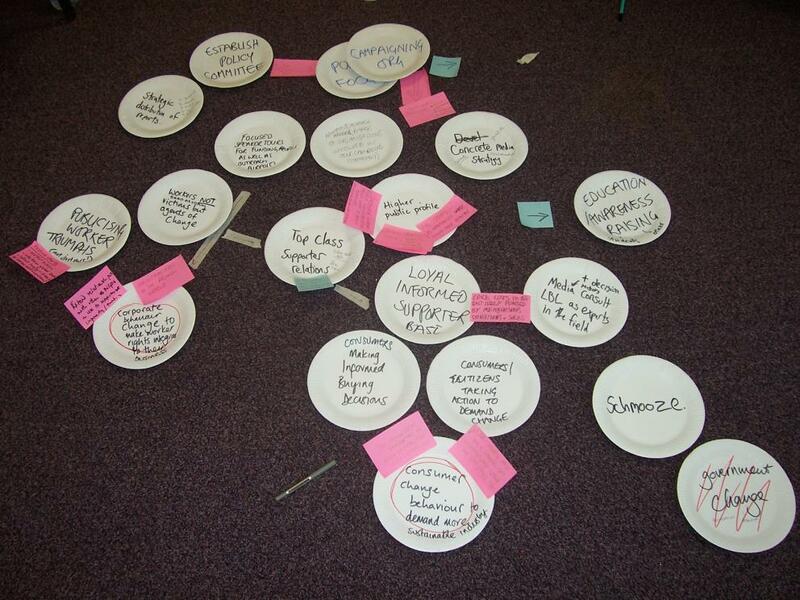 Other key areas of difference were identified for future discussion. There was still plenty of work to be done at the end of the day. The strategy will need future meetings of one kind or another. If you’re a funder reading this, please consider making funds available to support giving strategy the time it actually needs. If you’re a group or organisation planning a strategy day, can you give it longer? If you’re a facilitator share your thoughts – should we “just say no” to one-day strategy?